Anthropogenic noise is an important environmental stressor that is rapidly gaining attention among biologists, resource managers, and policy makers. Here we review a substantial literature detailing the impacts of noise on wildlife and provide a conceptual framework to guide future research. We discuss how several likely impacts of noise exposure have yet to be rigorously studied and outline how behavioral responses to noise are linked to the nature of the noise stimulus. Chronic and frequent noise interferes with animals’ abilities to detect important sounds, whereas intermittent and unpredictable noise is often perceived as a threat. Importantly, these effects can lead to fitness costs, either directly or indirectly. Future research should consider the range of behavioral and physiological responses to this burgeoning pollutant and pair measured responses with metrics that appropriately characterize noise stimuli. 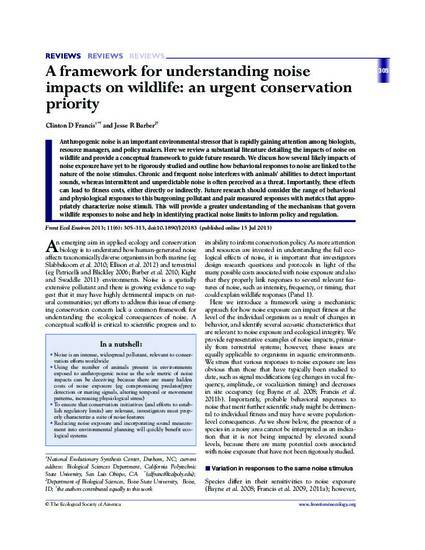 This will provide a greater understanding of the mechanisms that govern wildlife responses to noise and help in identifying practical noise limits to inform policy and regulation.